Beloved, there are many diseases right now infecting the Church. There is a reason why the Bible says narrow is the gate that lead to eternal life and few are those who find it. Everyone wants their ears tickled with stories of 800,000 plus people saved in one day at a Reinhard Bonnke sermon but those with discernment realize no one gets saved where the Gospel is not preached. The elephant in the church no one wants to talk about is the plethora of false conversions. The purpose driven church model has saved zero people beloved. Neither have the seeker friendly schemes of church growth. According to Romans, only the Gospel has the power of God unto the salvation of man. According to Acts, if a preacher does not preach the entire Gospel, then the blood of his listeners is upon his head. The Bible is actually pretty straightforward if we are willing to deal with some hard truths about where we are in the great apostasy. The real Gospel has been replaced by many counterfeits. Feel good, sugared up, watered down, prosperity, word faith and experiential gospels just to name a few. Then there are idols running through many of these false gospels. Just as sure as there were carved statues to bow down to in the Old Testament times, there are spiritual statues we bow down to today all in the name of the Jesus we do not know. 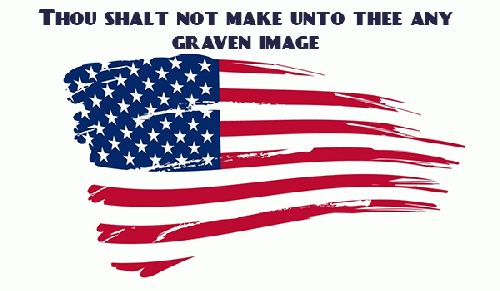 One of the most cancerous idols eroding the body of Christ is jingoism. Relax; jingoism is just a fancy word for extreme patriotism even to the point of desirous military dominance. Starting to sound familiar? Every other story on Charisma News is another prop piece for the president or how God has only blessed this country. There is a constant blending of social wedge issues with Biblical imperatives. As if when we stand before Christ He is going to review how many political rallies we attended and what our voting record looked like (He will not). It is an obsession with America that can only be rightly described as idol worship. The spirit behind it is a love for this world and the sin it offers. Many in church leadership in this country like their mansions. They like their sports cars and book deals. They like their positions of power and prestige -- just as the Pharisees did when Jesus walked the earth. So not surprisingly, they are enamored with revival, which the Bible does not promise in these end times. They believe if they could just get the goats in this country to behave better, then God will decide to not judge this country when He judges the nations. So to expose how this works we will review two "prophecies" from two different false prophets. One is taken from yesterday and the other from 2015, showing this has passed from trending to becoming an accepted part of Christian culture. It is why people as blatantly false as Paula White, Franklin Graham, and Jerry Falwell Jr. are celebrated for being so close to the least Christian president we have ever had. It is part of the move away from doctrine and biblical truth as we get closer to the return of Jesus Christ. Let me see if I have this right. Because the name of the winning team was Eagles, you think God was secretly trying to say something to His people? Beloved, you must realize that is what this absurd statement is really saying. Prophetic significance means God is saying something. So instead of making it abundantly clear, He hid it within the winner of the Super Bowl for Shawn Bolz to discover? I might add here that there are zero Bible verses that support the notion that eagles represent spiritual authority, prophetic significance or a big God-like vision. That is just more false prophecy spiritual gobbledygook designed to make people go ooh and ahh but signifies nothing in reality. Good thing the Steelers did not win or Bolz would have been talking about the spiritual significance of having our purpose stolen. Or the Vikings and our shipwrecked faith. Or the Giants and how we can't let the giants in our lives win. Ugh. I can do this all day too but that does not make it prophetic.